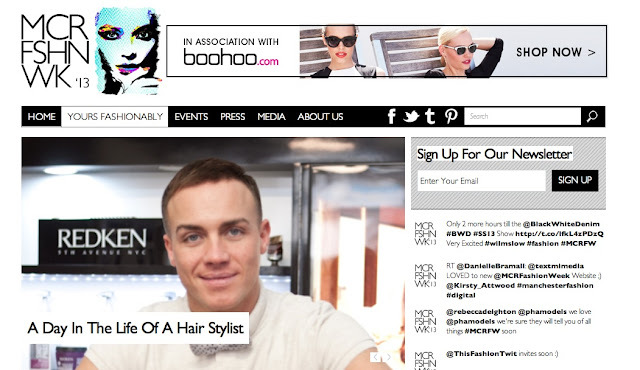 Fashion Fallows: Manchester Fashion Week: Relaunch and Reveal! Manchester Fashion Week's website relaunched this week with an exciting exclusive addition- part of the line up for the event! The MCRFW event in association with Boohoo, released part of their show schedule for the event which is to take place this April 22nd- 26th 2013 at The National Football Museum. Both High Street and Online names will feature on the MCRFW catwalk including official sponsors Boohoo alongside other well known fashion retailers NEXT, Ted Baker, Forever 21 and Reiss, and they are just the start! The event will host 30 fashion shows throughout the 5 days in April, as well as 20 exhibition spaces. The beginning of the week, (Monday, Tuesday and Wednesday) will be dedicated to High Street trends, featuring some of the best of what our high street faves have to offer! Thursday is a showcase for New Talent and Education, dedicated to future fashion talent, whilst Friday is all about the luxury designer collections hitting the MCRFW catwalk. I can hardly wait! It has now been confirmed that award-winning online retailer boohoo are this years Manchester Fashion Week headline sponsors. The Manchester based brand have become one of the leading online retailers for affordable, trend-led fashion since their launch in 2006. Inspired by catwalk trends and celebrity style they have built their own celebrity following including fans such as The Saturday's star Rochelle Humes, and Hollywood stars, Ashley Tisdale, Kylie Jenner and Ashley Benson. Attendees of the exciting fashion event that is #MCRFW13 will get the chance to view boohoo's latest mainline collection as well as an exclusive sneak peek of the next boohoo boutique collection, which won't be going on sale until the end of April 2013. Another event highlight will undoubtedly be Made in Chelsea star Jamie Laing's Candy Kittens label runway debut! Any MIC fans (including myself!) will be pleased to hear that the TV personality, Candy Kittens founder and the fun loving Chelsea "boi" will be in attendance to see his first ever fashion show as well as hosting a pop-up Candy Kittens candy shop featuring their new Spring/Summer range of sweets and fashion apparel. Keep your eyes peeled on the MCRFW website for more updates and announcements as Designers and luxury brands showing on the final day of MCRFW will be announced in the next few weeks when all show tickets go on sale to the general public.